I used to be one of those runners who could not run without music. I mean, we weren't allowed to use it in high school for races or even on practice runs. But when I would run on my own, the music was always in my ears. Music can be a huge help in getting through some runs. It helps your mental game during a run and it can even help with your speed. But there are a few reasons that you shouldn't always run with music. First, when you're running outside you need to be aware of your surroundings. You need to be able to hear and see and be alert to what is going on around you. It can be a safety hazard if you're running alone with headphones in and not paying attention to cars, animals or people. Also, some races don't allow headphones or even any kind of mp3 players. Due to safety hazards, I know that some races, both trail and road, encourage you to leave all of that stuff home. Because certain races don't allow headphones, it is always best to practice for race day and be used to the way you'll be running. Running without music in your ears is kind of amazing when it comes to your thoughts and clearing your mind. There are definitely runs that I take my music on with me. Actually, I do take my music with me every run, just in case I need to pump myself up a little bit at the end of a hard run, but I don't always use it. When I'm running outside I tend to let my mind wander on my thoughts. It's amazing how many problems I can solve (or how many blog posts I can come up with) when I run without music and my mind can freely wander. Like I said, running without music is not something that came super easy for me. 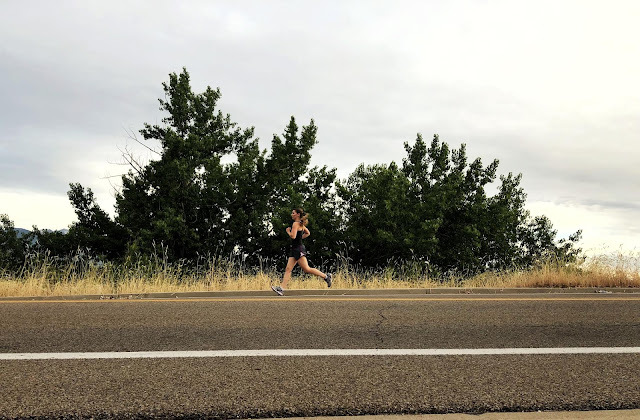 I went from running with friends and being able to visit with them to keep my mind busy, to running with music to drowned out my thoughts of being tried and it wasn't until this last year or so that I willingly gave up my headphones during running. Now, not all of my running is without music, when I do my treadmill runs I always have headphones in with my Aaptiv app on. I started to run without music about a year ago when I started listening to books or podcasts or talks from my church leaders during my runs instead. it was a little quieter than music and didn't have a tempo, so it was a good way to ease into running without headphones at all. When I started to do morning runs I decided to not run with music anymore except for on speed workouts. 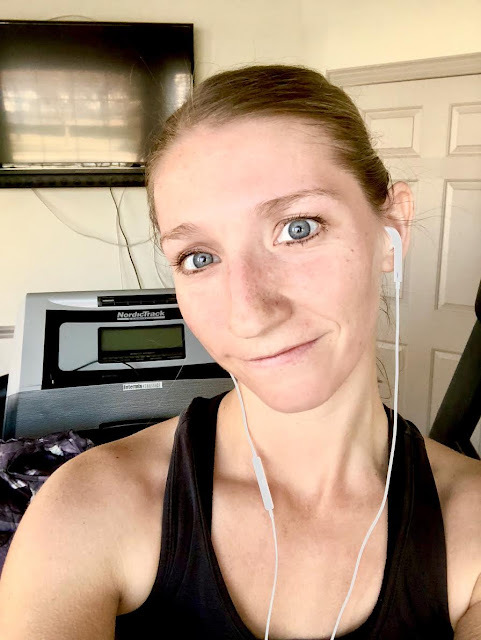 I thought it was going to be really hard for me to just stop but I noticed how much more relaxed I felt after getting back from a run that I did without my headphones in. My mind had time to process a lot while I was running and it made me enjoy my runs even more. There is still an occasional run that I'll listen to music, but mostly I just go. I love it, especially on my long runs! Do you listen to music every time you run? I used to love running with music, but for safety and the fact that we can't for races around here, I just stopped and I really don't miss it. I just let my mind wander instead! I thought I'd miss it and struggle a lot too, but honestly I don't even notice most of the time! I don’t wear headphones on a treadmill or when running with other people but I do usually when going solo. It’s never bothered me not to have them during a race because my adrenaline is there to pump me up. Finn how we think we are so reliant on the music to distract us but we really never needed it to start with haha. I do listen to music most of the time -- it helps me zone out and not focus on every stride and possible twinge -- but I don't listen to music when I'm running with my dog -- I want to be as alert as he is! I can really go either way. Most of my runs are with friends, so I leave the music home. When I'm by myself, I'm usually in the dark, so I skip the tunes for safety. However, if it's bright enough and I'm flying solo, I do like some music. Besides triathlons and some prediction runs, I've never raced in an event that strictly forbade music. In race situations, I would keep the volume low and have one ear bud out, and now that I have my Aftershokz, I just keep it low enough to hear around me. It's so funny--I used to run without music because that was the only option! Then the iPod was invented (I'm old). I resisted for the longest time, but once I took the plunge I never looked back. I could go either way and there are times I run without music. But running actually makes my runs feel easier and I can go farther, something that is backed by research. I used to run with music. I don’t anymore and I don’t miss it. The only time I need a distraction is in the treadmill. I listen to podcasts. I used to always listen to music. Then one day I forgot my iPod for a 15K race I was doing which was pretty far from home (I only discovered it when I arrived). I panicked and then thought "you know what? you are running in one of your favorite cities over several bridges with lots of people and architecture to see! you'll be fine!" And I was :) From then on it was less and less. Now I do it VERY occasionally, sometimes fast music when I'm running intervals for example. I only started running about 5 years ago and always ran with music. Then at my first race (the 2013 Chicago Marathon) I had the buds in my ears but didn't turn on my music while waiting to start so I could hear the announcements. I completely forgot to turn the music on when the race started, and by the time I realized it, I decided to leave it off, and ran the entire race with the buds in but no music! I didn't want to do ANYTHING different and since I 'trained' (sort of) with the buds in...I left them in! Since then, I have never once run with music--mostly because of safety reasons, since I run alone.